Potassium sorbate is a synthetic compound that is used for a variety of commercial and domestic uses, for example in the baking industry as an alternative to yeast. In addition it is also used in other industries like dried meat, cheese, apple cider and other products. The primary use of potassium sorbate is to increase the shelf life of various commercial products without causing any alteration in the taste, smell or color of the food. It is generally preferred over products like sulphur (since metabolism of sulphur produces obnoxious gas sulphur dioxide that may produce an undesirable taste sensation or burping). Besides, addition of potassium sorbate also aids digestion. However, its possible side effects cannot neglected. Potassium sorbate is a chemical compound that is produced as a result of chemical reaction between potassium hydroxide and sorbic acid to produce a white, sometime yellowish crystalline powder. It is slightly acidic in nature with a ph of about 6.5. When mixed in water it forms a weak acids solution of sorbic acid. It is widely used as a chemical preservative. This property is attributed to its slightly acidic nature that prevents the growth of microorganisms and thus prolongs the shelf life. It is widely used in the packaging of canned fruits, vegetables, dairy products (cheese and yogurt), and meat products (beef ad fish). Potassium sorbate is used as a finalizing preservative to retain the flavor and taste of the wine after the completion of final distillation and fermentation processes. This is because, wine is produced by fermentation of fruits (that are high in sugars) by yeast; however, even when the final taste is achieved, there is still yeast and some sugar left. Without potassium sorbate, the fermentation process may continue; thereby changing the taster of wine. Potassium sorbate is added to control and limit the excessive growth of yeast in the wine. Enriched hair care and skin care products are always at risk of getting contaminated by the growth of fungi and molds; however, if chemical agents like potassium sorbate are added to the mixture, the fermentation process can be easily controlled and personal care products can be used for a longer period of time. Potassium sorbate is also used for a variety of industrial processes like in pain industry, rubber and plastic industry and other commercial and synthetic manufacturing units. 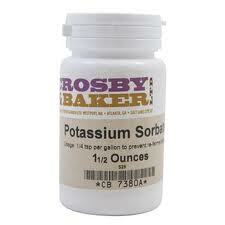 Is Potassium Sorbate bad for your health? Some people may develop extreme reactions and irritation when potassium sorbate comes in contact with skin, hair or other parts of biological membranes. How to Prevent the Side Effects? Filtration of wine can be done in order to reduce the risk of side effects. In addition it is recommended to avoid adding any potassium sorbate to the wine mixture and in order to retain the flavor of wine, make sure to check twice that the wine mixture has no yeast activity. Moreover, store the wine in a clear bottle and choose a dry and cool place. Healthcare providers, dietitians and researchers suggest that natural and organic foods are far more superior to inorganic or canned foods in terms of nutritional and metabolic values. Limiting the use of canned or preserved food decreases the intake of preservatives and chemicals. Similarly limit your intake of packaged fruit juices and increase your intake of fresh fruit and organic juices. This is also helpful in maintaining the normal levels of potassium in the body (canned products are also high in potassium and sodium). 1. Ideally it is recommended to maintain special caution while preparing and storing potassium sorbate. For best results, the storage temperature must not exceed 100 degree Fahrenheit. Moreover, intense exposure to light should also be prevented. 3. Most importantly, maintain extra caution if you are preparing potassium sorbate in the laboratory or dealing with the solution for synthetic purposes. This is because potassium sorbate is extremely combustible and if it is spilled on your clothes; make sure to avoid fire or heat contact. 4. In case of any mishandling or accident, take extra effort n cleaning the area, especially if you spill it on a carpeted surface. Clean and rub repeatedly to extract the potassium sorbate absorbed in the carpet. Can I Take Nyquil with Claritin?